Come and paint en plein air in the warmth of the Santorini sun in the Greek Cyclades, the legendary site of the lost city of Atlantis! The workshop will with an introduction to the necessary equipment and supplies needed for working on location, followed by a discussion of the fundamentals of sound painting en plein air. 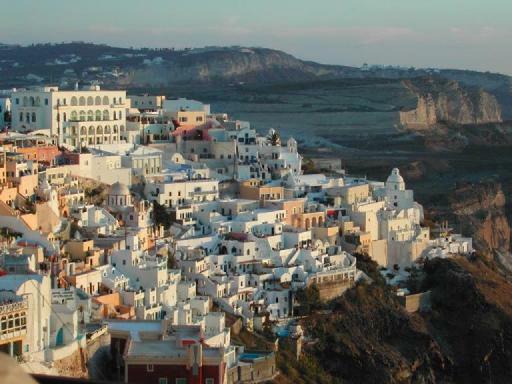 During the week we will visit the towns and villages of Fira, Imerovigli, Oia (pronounced Eee-ah), Kamari beach, along with a local harbor. We will also explore the inner islands during a day cruise, with optional visits to hot springs & the volcano, as well as the island port of Thirassia. Changes in light throughout each day, local activities and sunsets over the caldera will likely add to the variety of images we will capture. bold color and vibrant sunlight. in the warm ambiance of Santorini, overlooking an ancient volcanic caldera, claimed site of the lost city of Atlantis, originally fortified by the Minoans, claimed by the Romans, touched by the Venicians, almost unchanged for centuries, one of Greece�s jewels. the joy of learning and gaining plein air skills and confidence with the expert instruction of an acclaimed pleain air painter and the camaraderie of a small group of learners. great Mediterranean food, delightful Santorini wines, new friends, breath-taking vistas, history and the hospitality of the people of Santorini. 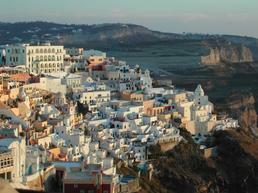 -7:00p Welcome to Santorini wine & chocolate tasting at Zafora. All times for all sessions to be deternined. Some days may have early starts and/or late ending times. Evening dining hours to be determined. Taxi to hotel Nissos Thira upono arrival is the responsibilty of each guest. Arrange departure taxi through Hotel front desk.